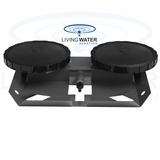 Living Water Aeration pond aerators are efficient, affordable and safe systems for circulating and adding oxygen to large volumes of water. 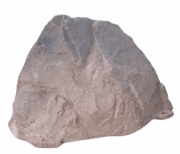 Our pond aeration systems are guaranteed to increase oxygen levels in your pond. These systems de-stratify, prevent oxygen depletion and fish kills. With no electricity in the water, our pond aeration systems are safe for any type of water recreation. 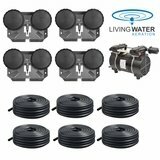 Easily aerate multiple ponds w/ this one unit! 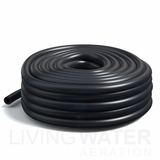 The compressor comes with weighted tubing, making it easy to install: The tubing will sink by itself to the bottom of the pond without the need of any additional weight making it invisible to the eye. It will also decrease the chances of the airline being snagged by fishing lines or swimmers. 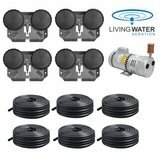 Because there is no electricity in the pond, this diffused aeration system is completely safe for people or wildlife near and in the water. The only maintenance needed being the replacement of diaphragms when needed. Repair kits are available on our website. (a noticeable and sudden drop in air bubbles after a few years of operation is a sure sign that the diaphragms need to be replaced). Be sure to clean the inlet air filter on your compressor regularly. Wash dirty air filters in soapy water. Replacement filters are available on our website as well. An illustrated instruction guide is available to view here. Click here to access a downloadable PDF version. 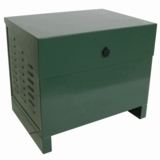 This type of compressor needs to be protected against weather (rain, snow or other elements) for it can cause irreversible damages. 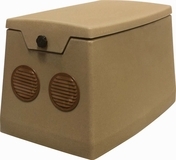 It is essential that you provide a shelter to protect your compressor (a waterproof cabinet either made of steel or of polyethylene- see under Cabinets or Deluxe Kits for more information). Also, make sure that your compressor does not sit directly on the ground but is elevated slightly above ground: dirt and dust could cause damage to the engine. Any cabinet sheltering an aeration system should also be adequately ventilated with a fan to avoid any kind of overheating. Try It Today Risk Free with Our Unbeatable Warranties! *Stock is limited. Order today to ensure availability. 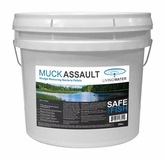 Order Your System Now and Keep Your Pond Clear! Pond Boost Beneficial Bacteria - 25 lbs. Join Our Newsletter // Special email offers and more! 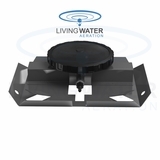 © LivingWaterAeration.com. All Rights Reserved. Site designed & developed by Your Store Wizards.